From the author of The Strange and Beautiful Sorrows of Ava Lavender comes a haunting tale of magic and murder. When Rona Blackburn landed on Anathema Island more than a century ago, her otherworldly skills might have benefited friendlier neighbors. Instead, guilt and fear led the island's original eight settlers to burn "the witch" out of her home. So Rona invoked the privileges of a witch; she cursed them. But such a spell always comes with a terrible price, and in punishing the island's residents, Rona also bound her family ever tighter to them. Fast-forward to the present day and all Nor Blackburn wants is to live an unremarkable teenage life. And she has reason to hope that she may have escaped the thorny side-effects of the family matriach's curse. But then a mysterious book comes out, promising to cast any spell for the right price. The author - Nor's own mother - seems capable of performing magic that should be far beyond her capabilities. And such magic always requires a sacrifice. Leslye Walton was born in the Pacific Northwest, a location that features prominently in both of her novels for young adults. 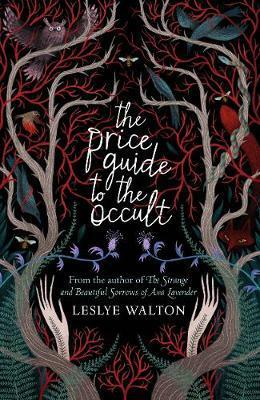 Her debut, The Strange and Beautiful Sorrows of Ava Lavender, was published to critical acclaim in 2014, and was shortlisted for the Waterstone's Children's Book Prize, as well as being named a William C. Morris YA Debut Award Finalist. Leslye is a full-time writer living in Seattle, and spends her time eating chocolate cupcakes and doting on her chihuahuas, Mr. Darcy and Doc Holliday.